"Shree Ganesh Enterprises", is the Importer, Distributor Multi Functional Beauty Salon Machine. Backed with support of experts, we are occupied in providing a flawless series of Q Switch Nd YAG Laser to valuable customers. used.It was designed according to the common and necessary functions used in Beauty Salon. 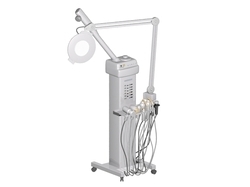 We offer this 5 in 1 Multi Functional Beauty Equipment which enhance the beauty with care also which can be used for hair removal, acne, skin rejuvination, pigmentation, face lift and obesity purposes.